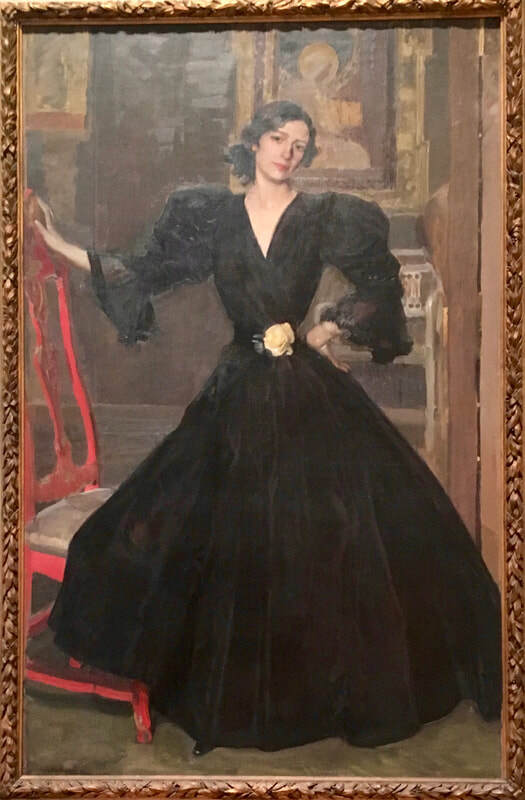 ​"Señora de Sorolla in Black" a 1906 painting by Spanish artist Joaquin Sorolla y Bastida, depicting his wife, Clotilde Garcia del Castillo, in a striking evening black dress, is at the Metropolitan Museum of Art in Manhattan. Clotilde was Sorolla’s muse. She would travel with him everywhere. She was also his bookkeeper. He called her "my Treasury Minister." As Clotilde posed for the painting, Sorolla included the background: a painting, of a female saint, which he had painted during the first few months of their marriage. 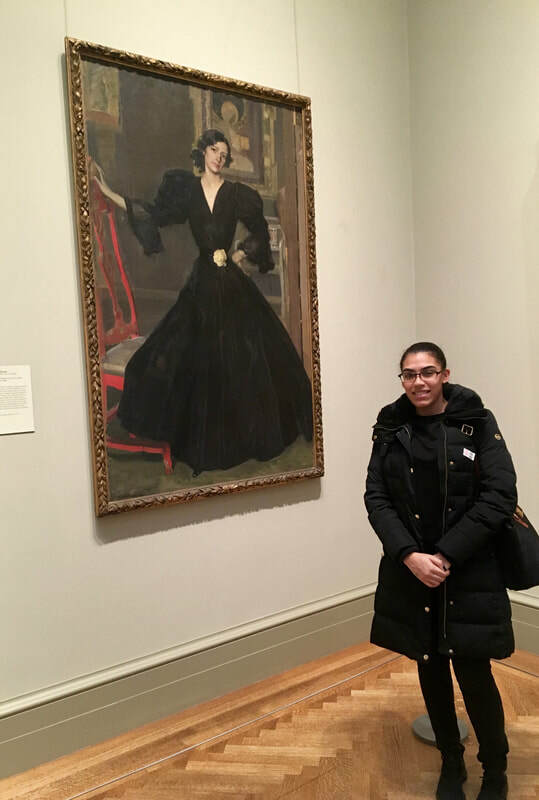 "Señora de Sorolla in Black" hung prominently in Sorolla's widely successful 1909 exhibition at the Hispanic Society of America in New York, where it was purchased by the Metropolitan Museum of Art. Sorolla was born on February 27,1863 in Valencia, Spain he grew up with his maternal aunt and uncle after his parents died, possibly from cholera. He started his art education at the age of 14 and by the age of 18, he was traveling to Madrid to study the master paintings in the Museo del Prado. After serving in the military, at the age of 22, he received a grant to go study art in Rome, Italy. "Sorolla's efforts as an artist were focused mainly on the production of large canvases of orientalist, mythological, historical, and social subjects for display in salons and international exhibitions in Madrid, Paris, Venice, Munich, Berlin, and Chicago", according to Sorolla's website, the "Joaquin-Sorolla-y-Bastida.org." After his death on August 10, 1923, his wife left most of his remaining paintings to the Spanish people. She turned their home into a museum – the Museo de Sorolla, in Madrid.